Despite various drawbacks, remote courses (both for credit and for pure learning) are becoming the emerging norm. Understanding the options makes for good use of time. If I were obliged to choose industries that are susceptible to significant disruption in the next few years, I would have to point to education as being the most obvious and most important. In a generation and a half, education has gone from being an expense that most families bore manageably or with some difficulty to an extraordinary cost that can plunge students and their parents into deep, long-lasting debt. Rather than being the path of upward mobility that it was for generations, education has evolved into the principal barrier between the wealthy and the rest of us. 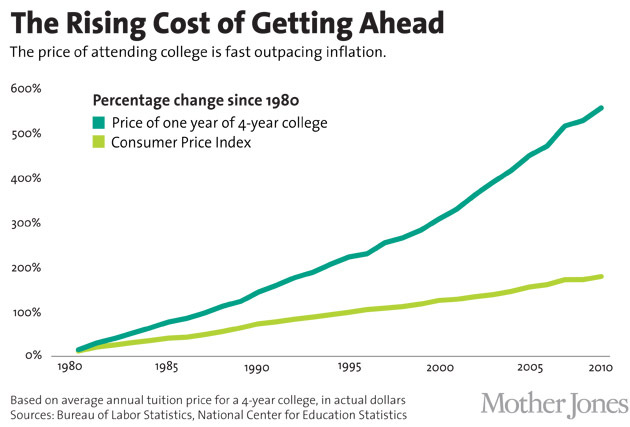 Education costs have risen far faster than inflation and can be accommodated mostly by parents who begin saving towards the expense the day their child is born. The current model cannot continue along its present trajectory. It is ripe for disruption, particularly in the programming field where developers are always partially self-taught and demonstrated skill, rather than coursework completion, is the defining hiring criterion. Several forward-looking universities have embraced this upcoming transition to greater self-education and begun making it possible to get college credit and degrees via remote study. Other universities, such as MIT and Stanford, have adopted open courseware in which they make it possible for students to audit classes via videos of the class sessions or, in some cases, watching in real time. And for some classes, university credit can be obtained for this remote participation (graded homework and exams are part of the experience, of course). I believe this model of remote courses taken for credit and paid for at much lower tuition rates will in the next decade emerge as the default way of getting a college education. The traditional four-year on-campus experience will be viewed as a singular luxury. Computer science is likely to lead the way in this transition because, more than most disciplines, it does not require face-to-face communication (as would a degree in music performance, for example). Developers today already enjoy a wide assortment of online learning resources, which I'll discuss shortly. There is no doubt that a motivated student can get the instructional equivalent of a four-year degree in computer science right now. Likewise, existing developers can easily round out their skills. The problem, though, is that online courses are still very much in their infancy: The materials and the learning experience are still far from ideal. The experience is often incomplete because courses make little provision for remote students and offer limited ways for them to offset the missing elements of the on-site experience. This is changing with massive online open courses (MOOCs), however. Today, the professional developer who wants to gain new skills via remote instruction has, roughly speaking, three large categories of options: passive learning, active learning, and cross-over tools that are mostly passive with some active elements. Each category delivers a different kind of experience . Early days of the instructional revolution generated mostly passive instruction, but this model has slowly become less favored. Students buying courses want some form of interaction with their peers and their instructors. Among the most active options with regard to interactions are the MOOCs. Coursera and Udacity are the leaders. Coursera generally features university professors and involves graded homework, which upon completion, generates a certificate of attendance. Classes are pre-scheduled, so you must fit your schedule to the course's calendar. Udacity tends to have more short courses, which can be run at anytime. Like Coursera, they also involve graded work. Fee-paying Udacity attendees can interact with professors and receive a certificate of completion. Course fees are typically modest. Inexpensive, interactive, self-directed courses are the province of some alternative providers, such as Code School, which require you to type in answers as you go. A gamification theme makes the learning light. A flat monthly fee entitles you to take as many courses as you wish. For those who just want to quickly and inexpensively acquire new skills, CodeSchool is a most convenient option, although it is slightly constrained by a small list of offerings. Finally, there is the cross-over category, which is mostly passive but encourages you to follow along. A good example is the LiveLessons series from Pearson (the parent company of Addison-Wesley). These lectures start with tool set-up that relies frequently on open-source tools that the student is expected to download and use. The speaker then works through the course (which, uniquely, is a downloadable video file) showing his screen, which the reader is supposed to be duplicating on his home system. Two monitors are an important option here. Because no interaction with the instructor or peers is possible, any errors or problems need to be solved the traditional ways: Google, StackOverflow, and other forums. All these solutions are highly dependent on the quality of the speaker or instructor; and this is perhaps where the system still lacks maturity. There is frequently no way to tell beforehand how good the instructor is, how useful the materials are, and exactly what background is expected of the student. Prospective students must still rely a lot on trial and error to find the right resource. But as remote learning becomes the standard educational experience, this issue will be addressed and we will all benefit from high-quality, lower-cost education.